Recently I had the pleasure of making these thick and creamy potatoes Au Gratin from A Kitchen Hoor’s Adventures. They were a huge hit, and I will be making them again in the very near future. 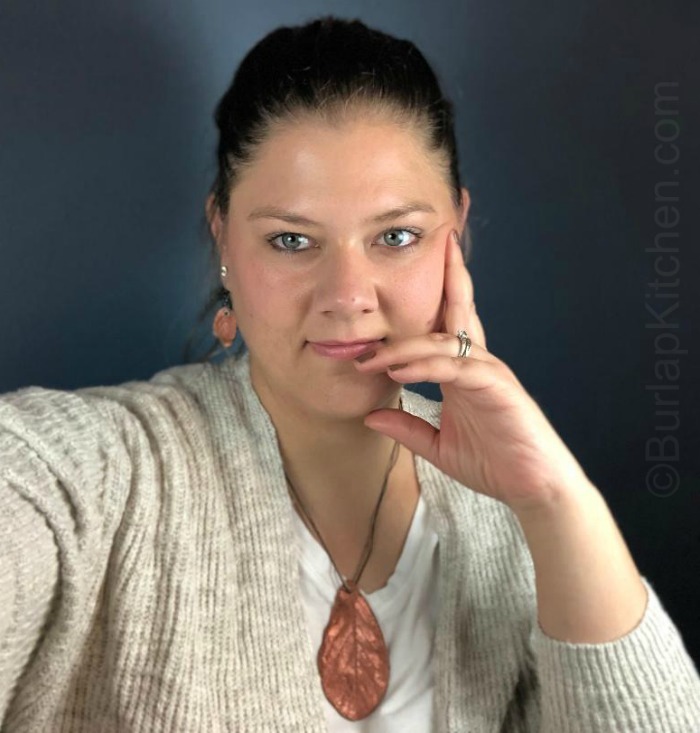 If you have yet to check out A Kitchen Hoor’s Adventures, then you’d better get hopping. She has so many delicious recipes that will leave you drooling. Trust me..
My Bacon Ranch Potatoes Au Gratin was adapted from A Kitchen Hoor’s recipe, thick and Creamy Potatoes Au Gratin. I had no garlic or gruyere cheese in the house. But, what I did have, was bacon, ranch packets, and shredded cheddar cheese. It’s hard to go wrong with those three ingredients. 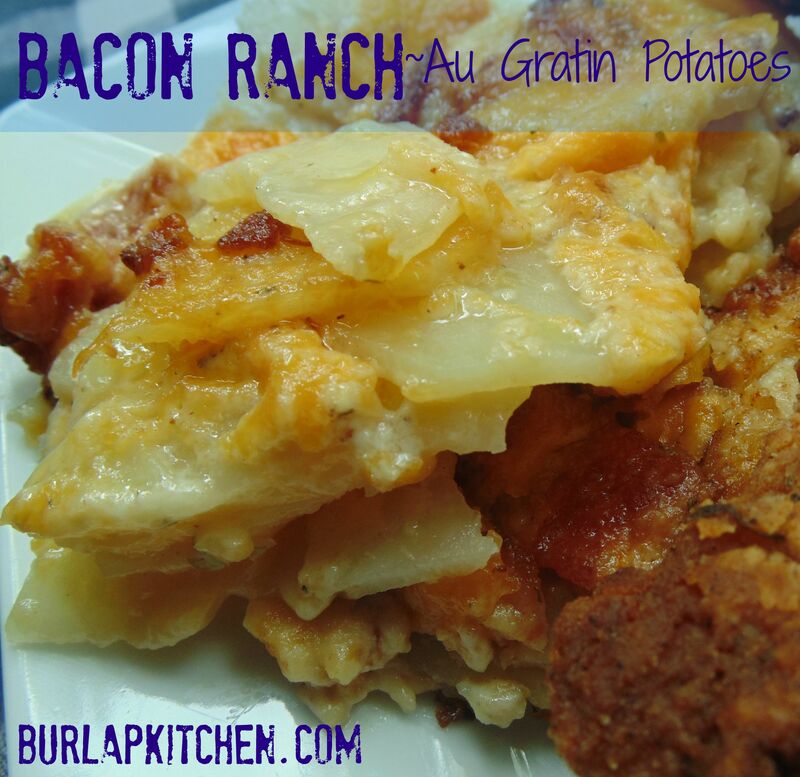 Add some potatoes and a few more ingredients to the mix and you have yourself a delicious pan of bacon ranch au gratin potatoes. YUM! Peel and wash potatoes; slice thinly using a mandolin slicer. In a microwave safe bowl, melt butter. Add potatoes to the bowl of melted butter, salt, and pepper to taste. Use hands to toss potatoes in the melted butter, salt and pepper, so each potato gets coated well. Place half the potatoes, evenly, in the bottom of a greased 13 X 9 cake pan, sprinkle, evenly, with 1/2 cup of the cheese; Repeat once. Using kitchen shears, or a sharp knife, cut or slice bacon into small bite sized pieces. Cook bacon in a medium to large saucepan over medium-high heat. Once the bacon has finished cooking, drain grease, and reserve 1 Tbsp. of cooked bacon for the top. Add milk, ranch packet, and flour to the saucepan of cooked bacon. Still on medium-high heat, wait for the milk mixture to come to a boil, use a whisk to scrape the brown bits up from the bottom of the pan, whisking often. As soon as milk mixture comes to a boil, turn off the burner, and carefully remove it from the heat, pour evenly over top the cheese and potatoes. Cover with foil and bake at 425 degrees for 50 minutes. Take foil off, and evenly sprinkle 1 Tbsp. of the reserved bacon and the last 1/2 C. of cheese. Bake and additional 10 minutes or until cheese is brown and crispy. Peel and wash potatoes; slice thinly using a mandolin slicer. In a microwave safe bowl, melt butter. Add potatoes to the bowl of melted butter, salt and pepper to taste. Use hands to toss potatoes in the melted butter, salt and pepper, so each potato gets coated well. Place half the potatoes, evenly, in the bottom of a greased 13 X 9 cake pan, sprinkle, evenly, with 1/2 cup of the cheese; Repeat once. Using kitchen shears, or a sharp knife, cut or slice bacon into small bite sized pieces. Cook bacon in a medium to large saucepan over medium-high heat. Once the bacon has finished cooking, drain grease, and reserve 1 Tbsp. of cooked bacon for the top. Add milk, ranch packet, and flour to the saucepan of cooked bacon. Still on medium-high heat, wait for the milk mixture to come to a boil, whisking often. As soon as milk mixture comes to a boil, turn off the burner, and carefully remove it from the heat, pour evenly over top the cheese and potatoes. Cover with foil and bake at 425 degrees for 50 minutes. Take foil off, and evenly sprinkle 1 Tbsp. of the reserved bacon and the last 1/2 C. of cheese. Bake and additional 10 minutes or until cheese gets brown and crispy.